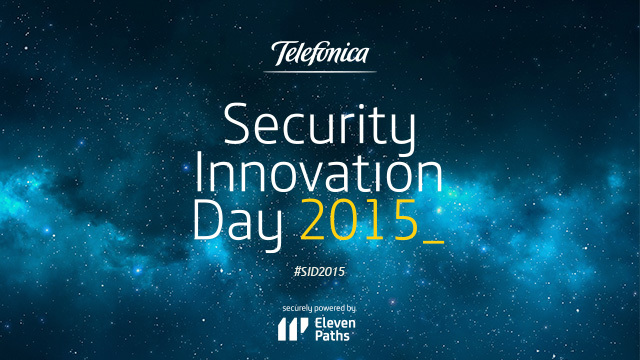 Madrid, Thursday, 8 October 2015.- Telefónica and ElevenPaths present today the company’s new cybersecurity product lines at our third Security Innovation Day conference. The improved and expanded services are a result of Telefónica signing strategic alliances with major partners and key players in the security sector including Alien Vault, BlueCoat, Intel Security, Palo Alto Networks, RSA, and Vaultive. Thanks to the input and technological capabilities of the new partners, ElevenPaths has improved and optimised its most powerful tools including Sinfonier, Latch, SandaS or Metashield Protector. Thanks to the agreement between Telefónica and BlueCoat, filtering systems used to access Proxy SG Internet will incorporate Metashield Protector technology –ElevenPaths’ solution preventing information leaks in all document environments–, meaning all files are scanned before publication in web services. All access information generated by Proxy SG systems is accessible from Telefónica’s SandaS platform, allowing companies real time access to IT security information. Moreover, along with GIN –BlueCoat’s IP reputation service–, SandaS can run filters or blockers in http/https accesses from a single point. With a continuously escalating threat landscape pushing cybersecurity further up the list of concerns for boardrooms and millennials alike, Palo Alto Networks is leading the charge in putting an end to successful data breaches. Within the category of cybersecurity services, Telefónica has teamed with Palo Alto Networks to develop a service that can discover mobile malware through integration with three industry-leading technologies: Palo Alto Networks next-generation security platform, which includes the WildFire – cloud-based malware analysis and prevention service-, Tacyt -the innovative cyberintelligence tool for mobile threats developed by ElevenPaths-, and Sinfonier, -the open system for real-time processing of information sources-. Through this integration, customers will be protected from malicious mobile applications on both the network and on mobile devices. Telefónica has also partnered with RSA, and now this company’s solution, Security Analytics, will admit connection with SandaS, providing a holistic view of companies’ security and the external threats and vulnerabilities that may affect them as well as risk, governance and compliance. For this purpose, Telefónica has partnered with Intel Security and now this company’s security event management and correlation system NITRO will be able to connect with SandaS and SandaS GRC. SandaS can also be connected to Alien Vault’s USM platform to improve its analysis and risk control capabilities, thus increasing those capabilities already existing in the integration with earlier versions. Telefónica, through ElevenPaths has joined Vaultive to integrate the encryption proxy service developed by the company. This protects the confidentiality of companies’ information in SaaS platforms, especially in Microsoft Office 365, with the Latch tool. This allows mobile device authorization and access to all Office 365 devices. ElevenPaths has recently acquired GesConsultor, the technology solution specialising in management and compliance systems (Governance, Risk & Compliance, or GRC), which from now on is integrated as SandaS GRC within its product portfolio. The Telefónica subsidiary has also acquired the intellectual property of the “Handwritten Signature Capture and Verification Development System in Mobile Platforms” software, which is linked to research work with the Carlos III University of Madrid. As a result Telefónica España is the leading company in billing, managed devices and implemented projects. Spain's top companies, public bodies and law enforcement forces and agencies rely on them for their cyber security.